On the first day at the ship, we stayed in port at the pier. I took some pictures of the JR while on the pier of angles that I knew I wouldn’t see while sailing. 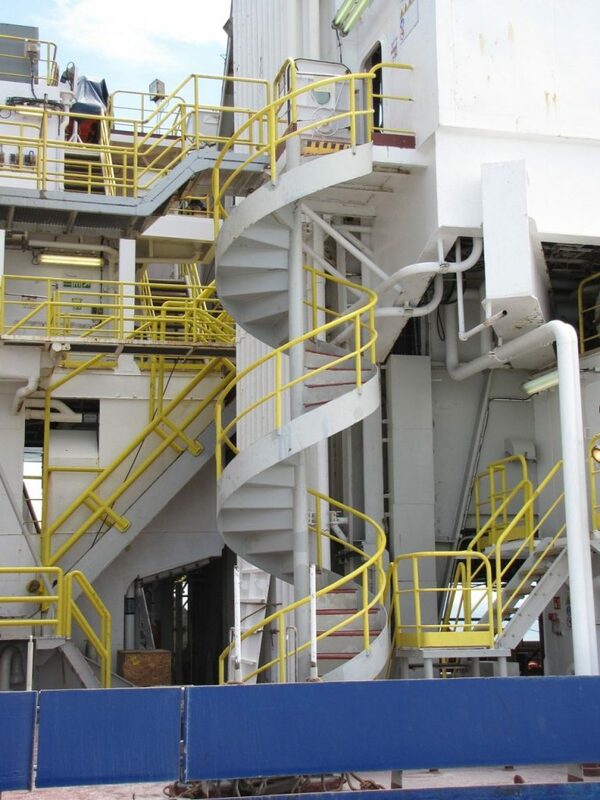 This spiral staircase leads up to an area where the drilling operations take place. Today I’m going to show you some of the ship via the ways to go up and down the 7 main decks. I’ll just post some of the fun pictures that I’ve taken of stairs. In shipboard lingo, all stairs are called ladders, regardless of whether they go straight up with big holes or have an pitch to the stairs. Floors are called decks. In the hotel area where all the cabins are, the stairwells only go in one direction. The landings lead to doors that quietly close. To go up 2 decks, you must open and close 4 doors. You must remember that the stairwell behind the left door is to go up and the stairwell on the right is to go down. In the lab, office and galley area there is a normal stairwell. Everyone uses these stairs. The chief mechanic started the Pet Wall in the stairwell. I hear that this is a JR tradition. Outside there are also all kinds of great ladders and stairs. This one makes me laugh. It is on the upper deck, above the bridge. It is 3 steps up and then 3 steps down. Over something that I’m sure is very important. Here are some ladders in the parts of the ships that the science team does not go. The engine rooms and near the drill. And then if you are exhausted after running up and down and getting lost, you can always just take the elevator!